The GNU Mailman project develops the world's most popular free mailing list manager. GNU Mailman has been in existence for over a decade, and is used by thousands of sites and by millions of people. 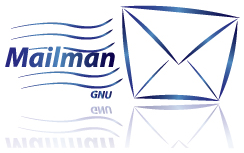 The GNU Mailman developers are actively developing new versions, while still maintaining the existing stable releases. The FSF supports the work of GNU Mailman through its Working Together for Free Software fund. Please consider donating below. Your donation will be used to obtain equipment, services, development resources, and other support for the GNU Mailman project. All expenditures will be approved by a committee chosen from core GNU Mailman maintainers, and will be fully disclosed on the main GNU Mailman website. To donate by check or money order, please mail one to the main Free Software Foundation address, with "GNU Mailman" in the memo field. Our Bitcoin address for this campaign is 1NydUCsiC4bExrAPvTMhtiZUbF8VWaPnzn. If you'd like to use a wire transfer of any currency, email donate@fsf.org. Please consider donating here if you don't feel it's possible for you to donate any time or help with GNU Mailman itself. The money you donate will help the GNU Mailman project. Any donation amount is greatly appreciated, and all donations are tax-deductible in the USA. If you check the "anonymous" box below, we will not publicly acknowledge your donation.